In the spring of 1718 a local Presbyterian minister wrote about the likelihood of “great desolation in the Northern parts of this kingdom”. He was referring to the growing migration from Ulster “to the American plantations. No less than six ministers have demitted their congregations, and a great number of people go with them; so that we are alarmed with both ministers and people going off”. This was the first organised migration from Ulster to North America – the 1718 Bann Valley Migration – and a packed programme of tercentenary events is already underway here and in America marking the relatively small beginnings of a massive migration that bequeathed 17 out of 44 USA presidents with Scotch-Irish roots. “The Scotch-Irish are the bedrock of the United States,” writes Ian Crozier, chief executive of the Ulster-Scots Agency, in his foreword to a booklet about the 1718 Migration, commissioned by the Ministerial Advisory Group of the Ulster Scots Academy with support from Tourism NI. The early settlers in America “shaped the nation, from the Declaration of Independence to the moon landings and beyond”, Mr Crozier’s foreword continues, “they have provided leadership out of all proportion to their numbers, whether as politicians, soldiers, business people, inventors or clergy”. 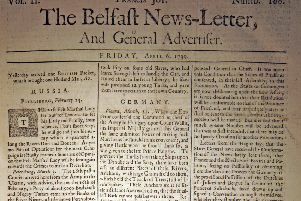 Roamer’s page has already mentioned some of the ongoing tercentenary events, and there’s an admission free exhibition entitled Causeway 1718: Society in Transition in Coleraine Museum from this Friday, May 11th. Garvagh Museum’s half-day conference about the migration, in association with the Ulster Historical Foundation, is in Garvagh’s Community Building this Saturday morning, May 12th. Townland Database is freely accessible at http://causewayfhs.org.uk linking surnames to townlands in the Bann Valley during the period 1660-1740. Some parts of the remarkable migration story have already been shared on Roamer’s page, about the 100 or so families, probably more than 500 people (some estimates have put the figure at 1,000 individuals) who departed from Coleraine and Londonderry, arriving in Boston from mid-summer to early autumn, 1718. Led by Aghadowey’s Presbyterian minister the Reverend James McGregor they are said to have sailed in five ships, though the actual number of vessels is not known for certain. Many of those first settlers’ graves can still be seen, including the Rev James McGregor’s son and daughter-in-law. The Rev McGregor was succeeded by 70-year-old Matthew Clerk, a battle-scarred veteran of the siege of Londonderry who resigned as minister of Kilrea and travelled to the new Londonderry in New Hampshire. Clerk died in 1735 and, as he had requested, was carried to his grave by old comrades from the siege of Londonderry. As well as settling in Londonderry, New Hampshire, early immigrants from Ulster lived in Worcester, Massachusetts, a few miles away at Sutton and in areas of coastal Maine. “My impression is that these leading families were men of some education and substance, and might have made their mark anywhere.” wrote the Reverend T H Mullin in his 1972 book about Aghadowey parish and its linen industry. There’ll be more family-details and migration accounts on Roamer’s page as the tercentenary progresses, such as Andrew MacFadden from Garvagh, who travelled with his wife Jane to Maine a year or two after the very first migration ships of 1718. Another endearing tale is included in the Ulster Scots Academy’s Migration booklet, about Mary Wilson Wallace, better known as Ocean Born Mary. Mary wasn’t part of the first migration, but was born in 1720 on board the ship on which her parents, James and Elizabeth Wilson, were travelling. The story goes that pirates attacked their vessel, and threatened all on board with death, but the new-born baby’s cries excited the pirate leader’s pity; he said if they named the child Mary, after his mother, he would spare the whole ship. Not only that but he gave the child a bolt of green brocade material for her future wedding dress. Mary Wilson spent the rest of her life in Londonderry, New Hampshire.